In the last few weeks, we have seen multiple case leaks tipping design of the unannounced Samsung Galaxy S7 and its variants. Now, latest in the series comes from Spigen case maker. Additionally, uSwitch has published some high-resolution renders of the Galaxy S7 claiming to show the handset in its full glory. Amazon has listed (via 9to5Google) various Spigen cases for the Samsung Galaxy S7, Galaxy S7 Plus, Galaxy S7 Edge, and the Galaxy S7 Edge Plus - all rumoured to be announced next month. As with othercase leaks, the Galaxy S7 and its variants are seen partially. In the case images, the Galaxy S7 is seen sporting a narrow square-shaped home button along with the usual multi-window and back buttons on either side below the display. The front-facing camera is placed at the top-right corner of the panel. The rear camera can be seen accompanied by an LED flash module. 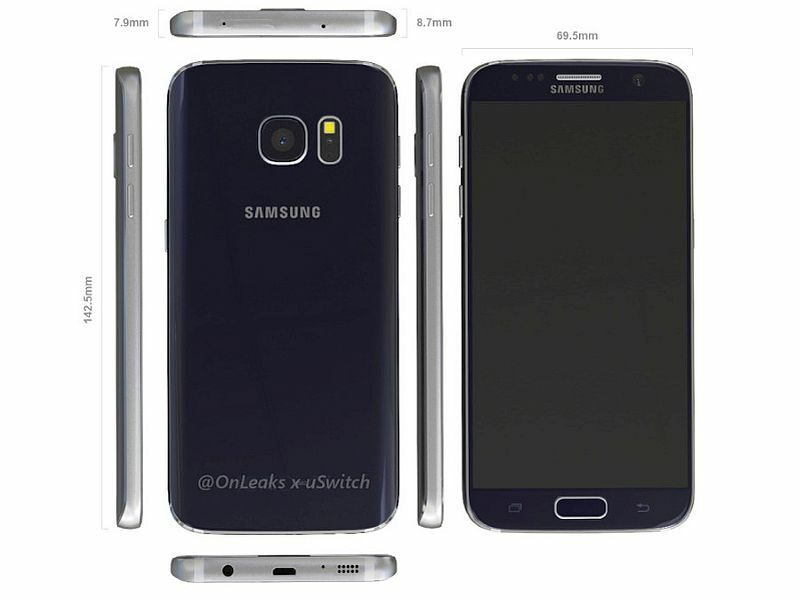 In separate leak, uSwitch and OnLeaks have published a bunch of Galaxy S7 renders. In the leaked renders, the Galaxy S7 front and rear is purportedly seen sporting a somewhat similar design language as the Samsung Galaxy S6. Further, the site claims that the Galaxy S7 will measure 142.5x69.5x 7.9mm. If the alleged renders are true then the Galaxy S7 will be thicker than the Galaxy S6, which measures 6.9mm in thickness. There have been recent reports pointing out that Samsung may unveil its next flagship Galaxy S7 and it variant smartphone models earlier (ahead of MWC 2016) on February 20 at the company's Unpacked 2016 event. Recently, purported specifications of the Galaxy S7 and Galaxy S7 Edge were tipped. The Samsung Galaxy S7 was said to sport a 5.1-inch display while the Galaxy Edge a 5.5-inch curved display. Both the smartphones were claimed to sport Super Amoled display with QHD (1440x2560 pixels) resolution. Both the handsets were rumoured to be powered by Exynos 8 octa-core or Snapdragon 820 processor. The leak further added that the handsets may come with 2.3GHz quad-core + 1.6GHz quad-core. Both the Galaxy S7 and Galaxy S7 Edge were said to include 4GB of RAM. The handsets were claimed to come in 32GB and 64GB storage variants while were also said to support expandable storage via microSD card (up to 200GB). On the camera front, both the smartphones were rumoured to feature a 12-megapixel camera with f/1.7 aperture. Under the hood, the Galaxy S7 may pack a 3000mAh battery while the Galaxy S7 Edge a 3600mAh battery. To compare, the Galaxy S6 and Galaxy S6 Edge+ featured 2550mAh and 3000mAh batteries.